NANOKOTE have developed innovative surface protection for sanitary ware manufacturers. We provide an easy clean coating for ceramic tiles, washbasins, shower screens, toilets and more. Our range of products streamline cleaning processes and ensure that restroom facilities are protected from lime scale and hard water deposits. By preserving commercial assets, return on investment is maximized and superior bathroom facilities are easily maintained. Glaze corrosion is an serious issue for bathrooms that are not cleaned properly. 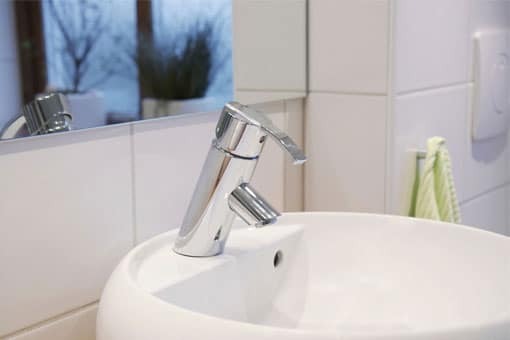 Over time, lime and other residues can build up on sanitary ware and can cause permanent damage on a molecular level. Also, you may notice discoloration in enamel and ceramic textures due to chemical stains, tainted water, fungi and mold. Use NANOKOTE products to keep your bathroom facilities looking sterile and bright. We specialize in hydrophobic and oleophobic thin films for application on the production line. When we apply our easy clean coatings at point of manufacture in a shuttle kiln, for instance, sanitary ware manufacturers can add value to their washbasins, bathtubs and similar products. To learn more about our manufacturing capabilities and how we can enhance your sanitary ware with an easy clean coating, contact us. Our industrial easy clean coatings feature abrasion and chemical resistance and are rated to last up to 10 years, which is ideal for commercial and industrial purposes. At NANOKOTE, we develop surface protection coatings and sprays for glass, and ceramic materials. For more information about how we can add value to your sanitary ware manufacturing processes or implement an easy clean coating that is scaled for your operational needs, contact us.